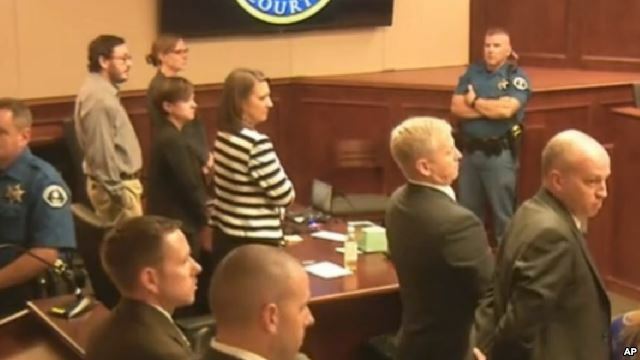 Colorado movie theater gunman James Holmes will spend the rest of his life in prison after a jury failed to agree on the death penalty Friday. The same jury found him guilty last month of the July, 2012 massacre in a suburban theater in Aurora, outside Denver. Holmes opened fire on audience watching the Batman film The Dark Night Rises, killing 12 people and wounding 70. Holmes stared straight ahead and showed no reaction when the jury's decision was read. He showed no emotion during the trial, even when the evidence was graphic and victims' family members testified about their suffering. Under Colorado state law, all 12 jury members must agree on the death penalty. Instead, Holmes was automatically given a life sentence with no chance of parole. Holmes' lawyers tried but failed to persuade the jury that the 27 year-old college dropout was mentally ill, suffering from schizophrenia and could not tell right from wrong. Prosecutors countered that Holmes knew what he was doing and had written about his murderous plans in a diary. They say he he listened to loud music through headphones when he shot into the audience to block out the screams of the victims.